This is an exciting week. The books come are scheduled to come in from the printer. Here is a copy of the news release that will be sent to area media announcing the news. Michelle Walker, an accomplished marathoner and mother of six children from Newburgh, Indiana, has published her first book, If You Give a Mom a Marathon: Six Kids and a Run Around the Word. Walker, 48, didn’t become a long-distance runner until her 30s but has now run more than 140 marathons around the world. That number includes 26.2-mile races on all seven continents and all 50 U.S. states. She has truly experienced it all – including crossing the famed Boylston Street finish line a short time before the horrific 2013 Boston Marathon bombing. When people ask Michelle why she chose to write a book, her simple answer is why not? For her, documenting her journey was simply a goal she wanted to achieve, so she did it. Writing and publishing If You Give a Mom a Marathon is the latest goal Michelle has turned into an accomplishment, thanks to hard work. Michelle is driven by her six kids – three boys and three girls ages 8 to 22 – and values her family and all the friends she has made on her various marathon quests. For Michelle, running quickly became her “oxygen mask,” the newfound hobby that helped her better balance her hectic life as she transitioned from full-time professional to busy stay-at-home mom as her family with loving husband, Allen, grew. By sharing her own story of achievement and occasional struggles, Michelle hopes that readers will be inspired to set their own goals as they work to find their own oxygen masks. Michelle is also proud that she will have this book to pass along to her children: Brett, Kelsey, Madeline, Mason, Layla and Harrison. Go along with Michelle as she explains how running races in Australia, Iceland, and even the deck of a cruise ship has helped fuel her on her family’s journey. If You Give a Mom a Marathon: Six Kids and a Run Around the World is a 168-page book that was published by IBJ (Indianapolis Business Journal) Book Publishing. It is available now through several online channels including on Michelle’s website, www.marathonmomof6.com, and Amazon. 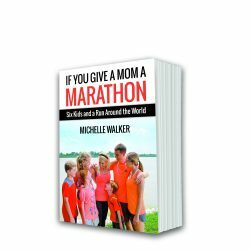 She is on Twitter (@MarathonMomof6) and can also be also be reached through her book’s Facebook page, Michelle Walker – If You Give a Mom a Marathon. © 2019 Copyright marathonmomof6. Powered by	WordPress & HTML5 Blank.